A former WeWork employee was sexually assaulted by two fellow WeWork employees at company-wide events — incidents enabled by the coworking giant's "entitled, frat-boy culture," a new lawsuit charges. Ruby Anaya, 33, who lives in New York City, started working in WeWork’s technology department as a director of product management in 2014, a lawsuit filed against the company and its co-founder Miguel McKelvey in Manhattan Supreme Court on Thursday says. In 2017, Anaya became WeWork’s Director of Culture, according to the suit. The lawsuit claims Anaya had just left the stage at a company-wide "Summit" event in January 2018 after presenting an award when she tripped over one of her heels and stumbled as she was trying to “navigate the large and alcohol-infused crowd,” the lawsuit says. Anaya put her hand on a man’s shoulder to steady herself, then apologized and told the man she’d almost tripped, at which point the man grabbed her waist, pulled her toward him and “forcibly kissed her,” the suit claims. She pushed the man away and slapped him, but he “just smiled at her,” according to the suit. 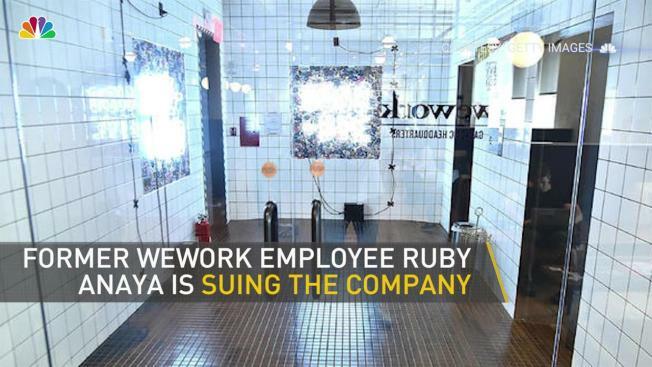 Anaya told her coworkers what had happened after the incident and reported it to WeWork's human resources department, but didn’t hear anything after a month, the suit says. When Anaya reached out to an HR employee about the investigation, the employee told her the company had interviewed the male employee, who'd said he "had ‘no recollection’ of the incident and… ‘would have remembered if he had been slapped,’” the suit says. The HR employee told Anaya the man was a “high performer,” and said the company had “closed out” the investigation, according to the suit. Distraught, Anaya sent a text message to McKelvey and to WeWork's Chief People Officer about the incident, but McKelvey never responded, the suit claims. The January incident wasn’t the first time Anaya was sexually assaulted by a male WeWork employee, according to the lawsuit. At a "Summer Camp" event in August 2017, Anaya was in a crowd of employees when one of them grabbed her from behind “in a sexual manner,” the lawsuit claims. Anaya took his hands off of her and told him not to touch her, but the employee “just smiled and walked away,” the suit says. Anaya reported the incident to HR the next day, but the employee later told HR he “was black-out drunk and had no recollection of the incident,” according to the lawsuit. The HR department told Anaya the man would take a sexual harassment prevention course, the suit says. Both men still work at the company today, according to the suit. The lawsuit claims WeWork co-founder Adam Neumann asked Anaya whether she drank tequila during her interview with the company, pouring her shots when she said she did. WeWork also stocks free beer at its outposts and “has a mandated happy hour for employees every Friday,” which employees are pressured to attend, according to the suit. The "Summits," for which attendance is mandatory, are “a huge, three-day, alcohol- and drug-laden party for all employees at the company,” the lawsuit claims. More than one WeWork employee in the company’s New York office “has commented to [Anaya]... that ‘it’s only a matter of time until someone gets raped’” at one of the company's events, the suit says. The suit claims Anaya was fired on Aug. 3, after she’d voiced “disagreement and distress” over WeWork’s decision not to fire the second WeWork employee who allegedly assaulted her, and brought up concerns about women at WeWork not receiving the same pay as men. “Aug. 3 was just before the company’s 2018 Summer Camp event, and just before [Anaya] was to vest in another tranche of her stock options — options that have increased tremendously in value since she began working,” the suit says. "WeWork has always been committed to fostering an inclusive, supportive and safe workplace," the spokesperson said in a statement. "WeWork investigated this employee’s complaints, took appropriate action, and this employee was terminated solely because of her poor performance." The lawsuit, however, claims Anaya “received almost exclusively positive feedback on her work efforts and performance” and “only positive performance reviews” up until she was fired. Anaya's attorney Seth Rafkin on Thursday said his client "denies the statement's WeWork's unidentified spokesperson has asserted." "We also note the obvious: if our client had been a poor performer for a year or more, why didn't WeWork ever give her a warning or a performance plan, something human resources professionals will tell you is typical practice?" he asked in a statement. "And why did the decision to fire her come only after she complained again about a sexual assault and the way it was handled?" WeWork's spokesperson on Thursday noted that WeWork's "Summits" are three-day business meetings, with a single evening event. Friday happy hours, the spokesperson added, are not mandatory. Anaya is seeking damages including lost wages and benefits, as well as attorneys’ fees and costs of suit. WeWork provides shared office space for rent by entrepreneurs, freelancers, artists and other businesses.